A 48 year old women presented with backache. The MRI suggested the presence of a metastatic involvement of multiple vertebrae. The biopsy from D11 showed it to involved by an estrogen and progesterone positive breast cancer. The X ray showed pulmonary metastasis. Treatment was initiated with combination of epirubicin, cyclophsophamide and fluorouracil with zolandronate. After the fourth cycle her haemogram showed a haemoglobin of 9.2g/dL, leucocyte count of 11.7 X 10,9/L and a platelet count of 80X109/L. and thrombocytopenia. 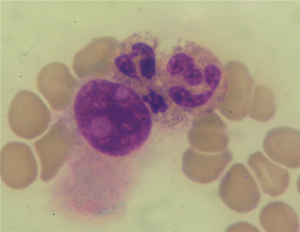 The peripheral smear showed a differential leucocyte count was 65% polymorphonuclear neutrophils, 21% lymphocytes, 3% eosinophils, 3% monocyte, 2% myelocytes, 1% metamyelocytes and 5% band forms. Nucleated red cells were seen. A bone marrow aspiration and trephine biopsy was performed from the right iliac crest. The aspirate was scanty and has paucity of particles. The microscopic examination showed infiltration by carcinoma. This was confirmed on the trephine biopsy. The cells were found to be expressing estrogen and progesterone receptors. 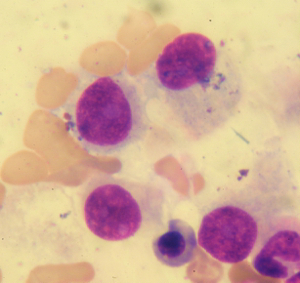 The images of the bone marrow aspirate are shown below. Bone marrow involvement by cancers is common. Common cancers involving the bone marrow in adults include cancers of the breast, prostate and lung. Neuroblastoma, rhabdomyosarcoma, Ewing’s sarcoma, primitive neuroectodermal tumors and retinoblastomas are the common childhood tumors involving the bone marrow. Bone marrow infiltration manifests with hematological anomalies. 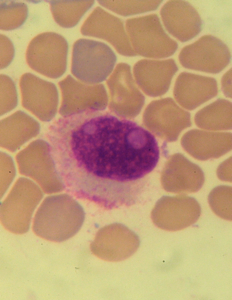 Leucoerythroblastic anaemia when present is most suggestive of bone marrow involvement. It is neither sensitive nor specific and is absent in about half the patients. About 70% of the patients have concomitant bone involvement and symptoms of metastatic bone disease – bone pain, fractures and hypercalcaemia may be present. Circulating tumor cells were first reposted by ash worth in 1869.